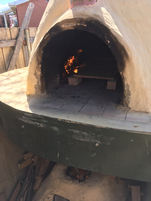 After completing all the rendering, building etc we were very keen to christen the pizza oven. One Sunday afternoon in late March (perfect early autumn weather here in Tassie) we invited about 30 people to come join us in a pizza afternoon. We supplied the pizza dough, cheese and tomato base and asked people to bring their own toppings and create their own pizza’s. The oven was lit about two hours before. 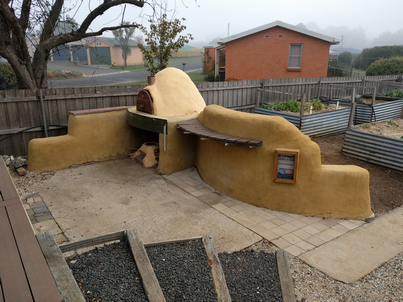 two small fires in the oven itself, one each side of the cooking platform ( at the time two terracotta planter dishes turned upside down on firebricks) and one fire in the rocket stove. 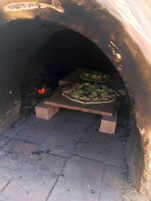 The two small fires inside ensure that plenty of heat is soaked up by the cob thermal mass of the oven and the rocket stove kept the temperature up as we cooked about 40 pizza’s between 2.00pm and 6.00pm. A great time was had by all. The next morning all there was in the form of ash in the rocket stove was half a dustpan full which goes onto the compost heap. Very efficient. Since that afternoon we have had several pizza cooking sessions. If we are just cooking pizza we only use the rocket stove. We have also cooked sourdough bread and a roast dinner which was very successful. An inner door was made that shuts off the chimney and keeps the heat in the oven. A fire was lit in the oven and heated it up. Pizza for lunch was first, followed by three loaves of bread and then roast pork. There is still stuff to be done to totally finish. We want to mosaic around the front of the suspended slab and mortar beach pebbles around the base of the earthbag wall. Looking back at the project it has been a lot of work but much fun and creative. It gave a chance to use lots of materials that have been hanging about waiting for a use. Earthbag walls are definitely useful where curves are wanted and support a lot of weight. Cost wise in Australian dollars we think it has been less than$600 including sand, cement, cement oxide, barbed wire etc. Here is a list of materials and whether they were new or recycled.